A concise, engaging, practical overview of children’s books that keeps the focus on the books themselves, this brief introduction to children’s literature genres leaves time to actually read children’s books. Written on the assumption that the focus of a children’s literature course should be on the actual books that children read, the authors first wrote this book in 1996 as a “textbook for people who don’t like children’s literature textbooks.” Today it serves as an overview to shed light on the essentials of children’s literature and how to use it effectively with young readers, from PreK to 8th grade. The authors use an enjoyable, conversational style to achieve their goal of providing a practical overview of children’s books that offers a framework and background information, while keeping the spotlight on the books themselves. It is the authors’ intention to encourage teachers to develop their own dependable book lists, and to do so they have organized the book lists at the ends of the chapters under five different headings: Fifteen Timeless Gems, Fifteen Gems of the New Millennium, Others We Like, Easier to Read, and Picture Books. 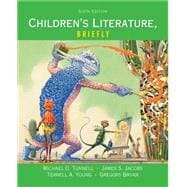 The new Ninth Edition of Children’s Literature, Briefly includes a poem and learning objectives at the start of each chapter; brief chapter summaries at the ends of chapters; a reorganization of the information from the first and last chapters into a new first chapter, which more clearly explains the importance of reading and how best to help children become lifelong lovers of reading; a new list of favorite titles, the Fifteen Gems of the New Millennium; the addition of pictures books as a separate category, rather than integrated within the chapter books; updated examples and new research findings; and a greater emphasis on modern publishing trends. Michael O. Tunnell teaches children’s literature at Brigham Young University and currently serves as chair of the department of teacher education. He has published several professional books, including The Story of Ourselves: Teaching History through Children’s Literature (with Richard Ammon), as well as a variety of journal articles about children’s books and reading. He also writes for young readers. Some of his titles include The Children of Topaz, Mailing May, Wishing Moon, and Candy Bomber: The Story of the Berlin Airlift’s “Chocolate Pilot.” He has twice served on the award selection committee for the John Newbery Medal, the oldest and most prestigious children’s book prize. James S. Jacobs began his career happily teaching English in grades 7 through 12. Next he taught at a junior college where, to his dismay, he was assigned to teach a children’s literature course. He discovered a new love and life path and returned to graduate school for a degree in children’s literature. Since then he has taught it at Brigham Young University. He interrupted his university life to gain experience in an elementary classroom, teaching fourth grade for two years at a U.S. Army school in Germany. His academic writing focuses on Lloyd Alexander, and he has written one picture book for children. Terrell A. Young teaches courses in children’s literature at Brigham Young University. He serves as a member of the Board of Directors of the United States Board on Books for Young People (USBBY) and previously served on the International Reading Association Board of Directors from 2009 to 2012. He has been a member of numerous book award committees. He has published many articles and books about reading and children’s literature and was the 2006 recipient of the International Reading Association Outstanding Teacher Educator in Reading Award. Gregory Bryan completed his Ph.D. at the University of British Columbia. He is now a member of the faculty of education at the University of Manitoba, Canada, where he teaches children’s literature and early and middle years literacy courses. Greg was born and raised in Australia and returns home as often as possible. His books include To Hell and High Water: Walking in the Footsteps of Henry Lawson in which he recounts walking almost 300 miles with his brother in extreme heat as they became the first people ever to recreate the experiences of Greg’s favorite writer, Henry Lawson, during his 1893 trek in Outback Australia. He is currently completing a biography of his favorite picture book illustrator, Paul Goble. 2. What Is a Good Book?